Students in school-based farming programs are exploring everything from hydroponics to robotics to entrepreneurship. If you haven’t visited a high school agriculture classroom lately, you may be surprised to see students immersed in cutting-edge fields like data science, biotechnology, robotics, and genetics. Instruction in many ag classes has changed in recent years to emphasize inquiry, project-based learning, and technology integration—all part of a national movement to prepare the next generation to feed a hungry planet. 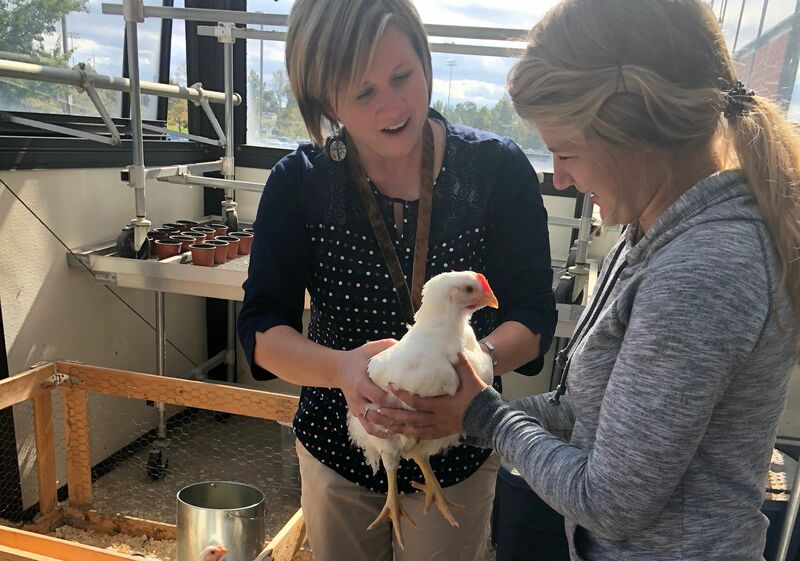 “I try to make my classroom relevant to real life,” explains Whitney Short, a National Agriscience Teacher of the Year honoree from Anthony Wayne High School in Whitehouse, Ohio, where she is also part of the Penta Career Center. When Short started teaching a decade ago, her classes were “pretty traditional,” she says, emphasizing production of crops and livestock. As her community became increasingly suburban, however, enrollment in ag classes declined. Short—who grew up in a farming family herself—realized that her programs needed a makeover to meet the needs of 21st-century learners. She began emphasizing the science of agriculture and health, and connecting her content to career pathways such as biotech, veterinary science, and food science. “It’s so much more than farming,” she says. Short also introduced project-based learning, which has given students more opportunities to ask questions and follow their interests. For one popular project—the Chicken Challenge—students investigate the driving question, “What’s the most effective way to produce the best chickens for market in the least amount of time?” As they raise chickens in a school greenhouse, students conduct nutrition trials, do research, and prepare marketing materials to explain their approach. It’s an academically rich project that also appeals to students’ desire for hands-on learning. “There’s the real life of caring for animals that rely on you,” Short says. The changes in her curriculum have made a difference. Enrollment in the school’s ag program has doubled in 10 years, with girls now outnumbering boys in many classes. Technology has become an integral part of teaching and learning in a classroom equipped with a polymerase chain reaction machine and other real-world lab equipment for genetic studies. Interest has also spread to the junior high, where Short’s STEM students are investigating the use of robotics in fishing lures and asking about using drones to gather data. “They’re teaching me,” she says, when it comes to emerging technologies. Four of Short’s students were among the 40,000 young people who gathered in Indianapolis in October for the National FFA convention. This annual event showcases the work of student researchers, FFA leaders, and young entrepreneurs, along with innovations developed by industry partners and technologists. Urban students are exploring everything from hydroponics to floriculture to entrepreneurship in school-based FFA programs. Across the country, FFA reaches some 650,000 students, who engage in classroom learning, hands-on applications, and leadership development. An emphasis of this year’s conference was a technology initiative called Blue 365, designed to emphasize the importance of innovation and technology in agricultural careers. Farmers are turning to data science, for instance, to make informed decisions using precision technologies about everything from soil quality to water use. Sustainability is another focus area for agriculturalists concerned about feeding a growing population with limited resources. Even food packaging—using biodegradable materials—is ripe for innovation. “These are the careers of the future,” Currie says. Today’s students will be grappling with big questions, he adds, such as, “How can we produce more food with less inputs? How can we make it more economical, and also better nutritionally?” Global issues also matter to many students pursuing agriculture studies. In his own career, Currie has worked on projects in places from Africa to Iraq.